Photo courtesy The Community Library, Regional History Department, Julian Newman collection Patrons of a bank/saloon on Ketchum’s Main Street gather for a photo in the 1880s. Frigid inside temperatures thawed by the warmth of companionship. Stinking piles of refuse generated from home-cooked meals. The bitter feelings of financial failure eased by a shot of whiskey and a pat on the back. The hardships endured by Wood River Valley residents in the 1880s were mitigated by a human propensity to endure, to adapt and sometimes to thrive under the most challenging conditions. Many newcomers were seduced by the prospect of striking it rich. A boom of galena, a silver-and-lead ore, had swept the area, turning places like Hailey and Ketchum into destinations of choice for a cross-section of society. Mixing together were the educated and the illiterate, Boise City natives and the foreign-born, skilled laborers and crafty entrepreneurs. "Most people came here to get rich," said Sandy Hofferber, regional history librarian at The Community Library in Ketchum. "Each one probably thought they were hitting the mother lode, whatever the mother lode was for them." Most, however, could not claim a life of comfort or riches, but all found ways to bring some pleasures to a hardscrabble existence. Food has long been a source of comfort, not just sustenance. Flapjacks and coffee were easy to come by in mining towns, but that simple menu left some people hungry for more. "Cooking as they would be up in the mines, one of the delicacies that came out of the deprivations was vinegar pie," Hofferber said. Added to a special meal might be trout, bacon or oysters, she said. The smell of vinegar might have been a welcome relief, as competition for the senses was intense. "Outhouses and livery stables were an affront to the olfactory sense, as well as contributors to polluted water," Clark C. Spence wrote in his book "For Wood River or Bust." Families often had a cow in the yard and chickens, and an outhouse around back. Garbage piled up, creating mountains of stench. Flies surely loved it. "The roads weren't paved, so you couldn't hose off the horse, cow and ox 'exhaust,'" Hofferber said. Hogs and dogs roamed the streets in great numbers, often creating nuisances, Spence said in his book. Pollution and sanitation problems frequently led to illness. Those who could not avoid catching the "catre," or cough, or worse ailments such as scarlet fever, whooping cough or cholera, would be transported to the outskirts of the town to avoid infecting others. "If you got (sick) in the wintertime, you're out there in tents outside the city," Hofferber said. "You were strong, or you were gone," she said. The introduction of railroads to the Wood River Valley improved availability of goods and facilitated travel. The first train arrived in Hailey in 1883 and in Ketchum the following year. Women populated the mining towns in increasing numbers when trains took over from stagecoaches as the preferred means of transport. "Having the train really made it much easier," Hofferber said. A burgeoning population meant more services needed and more business opportunities. 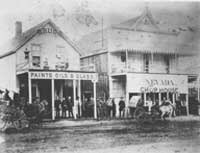 Hotels, boarding houses, general merchandise stores, sawmills, law offices, dentists' offices and many, many saloons lined the streets. Townsfolk must have had to deal with sensory overload every day, Hofferber said. "Industrial plants, ore crushers going 24 hours a day, and the sluices, the flumes and the trains coming in and out," she said. Soon, there was enough news—and opinions—to fill multiple daily newspapers. For those who could afford to enjoy modern amenities, errands in Ketchum might include a stop at the First National Bank, a trip to the doctor or dentist and a pickup at the pharmacy, and an evening get-together at The Cornucopia Bakery, Confectionery, Oyster and Chop House on Main Street. Its private dining rooms offered a quieter dining experience with one's family, away from coarse influences of other, less genteel patrons. Stores' offerings continued to expand, catering to the needs of a growing clientele. "A fine lot of fall and winter overcoats and suits, etc., received at Schweitzer's yesterday," noted a September 1884 edition of The Ketchum Daily Keystone. The paper's "Town Tidings" section also reported that "the fruit dealers in town received a fresh supply of fine eating apples from Boise yesterday." Gatherings at saloons could give rise to political arguments, criticisms of the mail service, discussions about anti-Chinese legislation, women's suffrage or veterans' benefits. Arguments heated up as empty glasses were refilled with a steady supply of alcohol. "I keep constantly on hand the celebrated Salt Lake City keg beer in quarter barrels, at 75 cents per gallon," boasted bar owner E. Bartsch in a September 1884 issue of The Ketchum Daily Keystone. Although a small town by many measures, Ketchum still provided more entertainment than more primitive mining camps. "H. Lefevre, Jr., is down from Vienna and reports times there dull," read the Sept. 3, 1884, edition of The Ketchum Daily Keystone. The valley saw a major storm in January 1888, which blew in enough snow to close schools in Hailey and Bellevue. Not in Ketchum, though. "The Ketchum school jogged merrily on without the least discomfiture," claimed the Daily Keystone. Residents likely did feel discomfiture, however, as temperatures plummeted to 40 degrees below zero. Several ladies reported to the Daily Keystone that their "fine collection" of house plants died because indoor temperatures dropped to below freezing. Log cabins and board dwellings that most people lived in offered little protection from winter's assault. "If we were to live under the conditions they lived under, most of us would buckle," Hofferber said. "I think that they were just strong, very strong people." To guard against the cold and isolation, people turned to each other. Winter days could be enlivened by sleigh rides to Guyer Hot Springs, snowball fights or songs around a piano. Dances, lectures, picnics, fundraisers and holiday gatherings provided the seeds for development of a little town that was quickly becoming a community.